Android One makes it easier for cheap smartphone manufacturers to keep up and Google gets more control. An impactful, if slightly confusing, map of places where the majority of users don’t have smartphones. Though companies like Samsung and Apple make it seem like a given that updated smartphones will come out all the time, it’s harder to get the balance right if you’re manufacturing for the developing world. To succeed in less affluent markets, manufacturers have to make cheaper smartphones, and it’s hard to develop something that’s inexpensive but still supports new hardware and software features. With its new Android One initiative, announced at Google’s I/O developer conference Wednesday, the company wants to take the engineering and design burden off of low-end manufacturers. In doing so, Google gains more control over the worldwide smartphone market. The idea is for Google to pay for the hardware development process so original equipment manufacturers (OEMs) don’t have to worry about passing the cost of R&D along to customers and can focus on fabricating at scale. The benefit for Google, other than feeling good about making a difference, is that company will be able to influence the low-end standards for Android devices. That way they’ll be sure that the stock Android operating system, which will ship on these devices, will function properly with minimal tweaking. 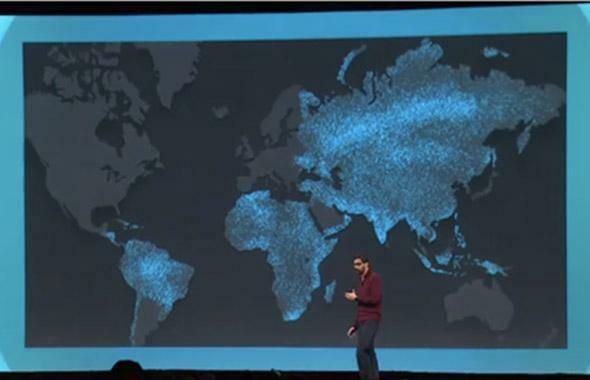 Google will be offering a consistent, attractive product in full all over the world. As different markets strengthen, their users will already be Android devotees. Pichai says that Android One is starting by collaborating with Indian carriers including Karbonn, Cromax, and Spice to negotiate low-cost data plans. And Google is working with manufacturers like Micromax on the first Android One devices. Pichai talked about one that is under $100 and has features like dual-SIM card slots, removable SD storage, a 4.5-inch display, and FM radio. Plus, Android One phones will get software updates through Google Play, so they can stay current even if someone owns a single unit for a long time. It’s a worthy project, but it’s hard to tell whether Google is spreading its wings or flexing its muscles.